A CV with no name? Home » Blog » CV with no name » A CV with no name? 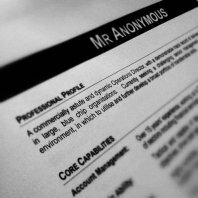 Anonymity, aka the CV with no name. Deputy PM Nick Clegg has announced that he wants the top employers in the UK to support the idea of candidates excluding their name and school detail from their CV when applying for jobs. The idea centres around the principal of a CV with no name, is that of breaking the monopoly of the “old boys network” and stopping institutional or racial discrimination. Whilst both ideas are laudable, the idea that you prevent this through making changes to a CV by creating a CV with no name, is itself ridiculous to the point of stupidity. Mr Clegg has put his name at the top of the idea, and the blame must start with him, (maybe he should have left his name off?). Does he really lack the understanding of what a CV is, and, more importantly what it provides? It’s the career history and talent of the individual that wins the opportunity for an interview not the name, school or race. Makes poor decisions based on lack of foresight and sector knowledge. 2 Responses to A CV with no name? I must say that somehow i agree with Nick Clegg because when candidates exclude their names and school detail from their CV when applying for jobs it would drastically reduce prejudice, discrimination and the so called “network”. The difficulty with the idea is that it will discriminate against the minority it’s supposed to assist. If you put two CVs with no names etc together for comparison the content will be the critical deciding factor. Coupled with this, you are then faced with having to speak and meet with the individuals. It is at this juncture that prejudice will remove persons from a process, therefore negating the original idea.